This research is intended to know how big influence of Accounting Information System and Effectiveness of Internal Control System at PT. PLN (Persero) Tbk Lhokseumawe City. In this study, the sample taken is 74 respondents. Data analysis method used in this research is using simple regression analysis. The result of research in simple linear regression analysis that is Y = 1,541 + 0,661X with correlation coefficient (R) 0,741 and Determination (R2) 0, 543 or 54,3% and 45,7% remain influenced by other variable outside. Partially (t-test) is known that t-test is obtained tcount> table is 9,367> 1,669 with significant level 0,000 <0,05, therefore it can be concluded that Accounting Information System has a significant effect on Internal Control System, the value of significance is smaller than 5% level, which means H0 rejected and Ha accepted. The conclusions taken in this study are; 1) Accounting Information System is very influential and significant to the Internal Control System at PT. PLN (Persero) Tbk Lhokseumawe City; 2) Based on the results of correlation and determination test Accounting Information System has a significant value to the Internal Control System. 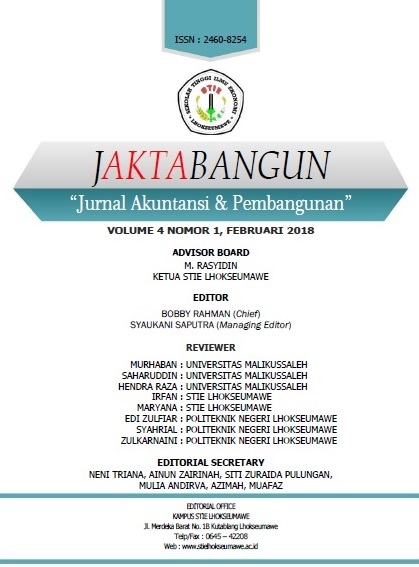 It is suggested that this research can be used as a result of the work in increasing the knowledge insight that can further broaden the mindset of the reader especially regarding the influence of Accounting Information System and Internal Control System.